Average. Used the optional turkey breast instead of pork. Probably would have been much better with the pork. Had to double the amount of chili powder and added a drained & rinsed can of black beans. This is a yummy, belly warming dinner. Since I used an Italian-style chicken sausage, I decided to play up the seasoning a bit more. I added 1/2 tsp. fennel seeds, 1/4 tsp. crushed red pepper, and 1 tsp. Italian seasoning. After reading the reviews online, I also opted to double the amount of liquid and used half white wine and half chicken broth. Cooking time was a bit longer than stated, my zucchini just took forever to soften. Probably due to high altitude, sometimes veggies just take forever to cook at 6200 ft. Served with some freshly grated Parmesan cheese. Two enthusiastic thumbs up for this dish. I use a rice cooker and stirred the green onions, rice vinegar and ginger in at the end of the cooking cycle. Really tasty accompaniment to go with some Asian-style fish or chicken. Skipped the basil at the end since I didn't have any and used my go-to pizza dough recipe in place of a ready-made crust. My onions were on the smaller side, so I used two. I really should have followed the instruction for stirring the sun-dried tomatoes into the sauce, but I got ahead of myself and started spreading sauce on the dough in autopilot mode without consulting the instructions. I then just sprinkled the sun-dried tomatoes on top of the sauce instead, but some got blackened which I don't think would have happened if they had a layer of sauce coating them. Still a very delicious pizza that I would definitely make again. Good weeknight dinner. Baked the catfish at 400 for 15 minutes instead of pan-sautéing. The accompanying tartar sauce was very good with the addition of a squeeze of lemon and a pinch of salt. Wow! This tastes like green bean casserole without the creamy sauce. Definitely use the shallots or it just won't taste quite right. I microwave my fresh green beans for 4 minutes to save all the dirty dishes involved with blanching, dunking in an ice bath and draining. It also tastes great if you deglaze the pan with a couple of tablespoons of dry sherry. Simple and tasty. Used broccoli slaw. A little minced chile pepper would be a very good addition next time. Used broccoli slaw. Tasted even better the next day. Doubled the small amount of brown sugar to better tame the acidity of the lime juice and cider vinegar. Love the idea of this recipe, but definitely didn't make it as written. Made my usual mashed potato recipe (steamed skin-on red potatoes, butter, milk, salt, & pepper) instead of using purchased mashed potatoes. I went a little overboard on the chives because I wanted to use up the small bunch I had in the fridge -- I liked the extra, but my husband thought it was a little overpowering. We both loved the Parmesan flavor. 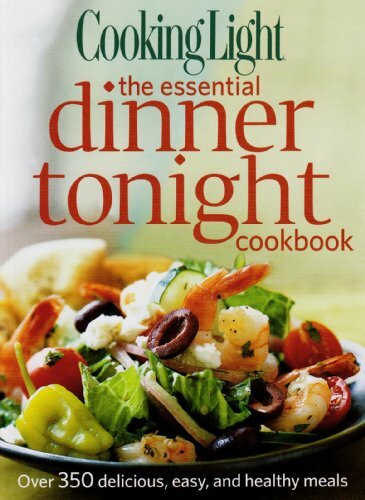 Cooking Light The Essential Dinner Tonight Cookbook boasts great-tasting, healthy recipes that help readers eat smart, be fit, and live well. With handy menus and meal plans, readers can make savvy, quick, and easy dinner decisions without sacrificing time or flavor.